Presenter Eddie Mair is to leave the BBC after more than 30 years, the corporation has said. 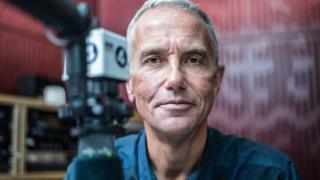 The 52-year-old, who has been a presenter on Radio 4's PM programme since 1998, will host his last show on 17 August. He joked: "I thought this was the appropriate moment to step out and give someone else a chance, before I'm so old my sentences make no lasagne." His successor will be announced in "due course", a BBC statement said. Mair tweeted his thanks for "all the kind words" from fans, and hinted he would appear elsewhere as he was "changing jobs". According to the BBC's media editor Amol Rajan, Mair is set to join talk radio station LBC. The BBC has also confirmed that Jeremy Vine will leave Points of View after presenting the programme for 10 years.